As an alternative to the usual fluffy favourites slots has a try of this game. Do you have what it takes to compete with the Gamma girl, the ditzy superhero flying the skies searching for the next best thing? With 5 reels and 25 paylines Gamma Girl is reminiscent of the mask in the way its gaudy colour scheme draws in the eye. This wacky pit stop is not one to miss on your way to online slot glory. Looking for other games? Find all our online slots here. Eyecon opened their Australian office in 1997 in Brisbane, the birthplace of many international gaming studios. This office focuses on the technical side of things, with a strong development and tech team whose sole purpose is to bring online slot games to life. With more than 6 Billion spins a year, Eyecon ensure that their infrastructure grows with them, and are able to support their ever-increasing number of players and clients that span the globe and deliver high-quality gaming solutions worldwide. Click here and find these top UK slot games in our list. 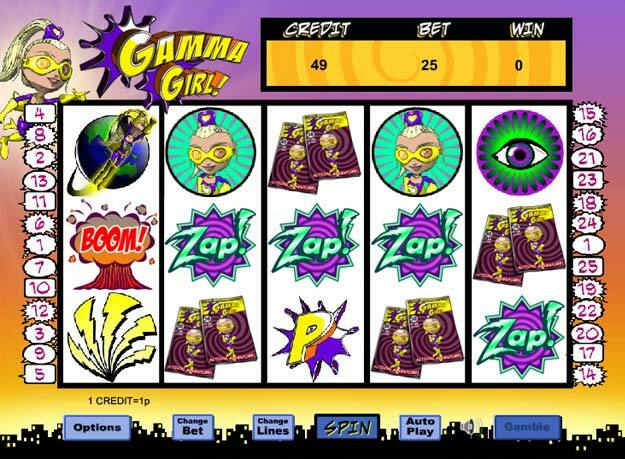 Gamma Girl is a 25 pay line, 5-reel slot that has a distinctive comic book ambience that is certainly clear when you look through the symbols on offer. The superhero requires your help to defeat evil and save the world offering you rewards following every spin that land the right combination. There are two bonus features available when you play this slot game. One of the awesome highlights is that you can line up the word K-A-P-O-W across the reels to score a superhero Word Combo bonus! The Gamma girl icon is the hero wild for the game, and if you score a winning combination of Fire scatters, you can unlock the Rescue Bonus round. This game offers the chance to multiply your bets by up to 100 times your original stake! If you score 3 or more Gamma symbols, this triggers the Gamma Girl Match and Win round where you can match pairs of symbols and scoop up more heroic jackpot rewards! We urge you to play the best-rated online slots today! Packed with features that bring the comic book to life in slot form. You can expect mostly purple and yellow as the main colours on this instalment with Gamma Girl also dressed in these complementary colours. 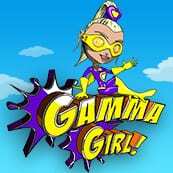 It’s your role to help Gamma Girl reclaim her additional superpowers and help her learn to fly. The reels will really grab your attention instantly with loads of classic comic book imagery including various visual buzzwords that are used in comic books such as “ZAP” and “BOOM” as well as other items such as bolts of lightning and newspapers. There is plenty of variety as well with bonus symbols triggering the features below. The game features scatter symbols and free spins that can be activated by spinning and matching the relevant pictures. The Fire is the scatter bonus symbol and when three or more appear across the reels you will find yourself in a bonus round that requires you to extinguish fires to reveal free games and multipliers. The other bonus round on this game is the Gamma feature which is triggered when you spin and match three or more Gamma symbols. This bonus round is a Match and Win game. You choose from a grid of 12 different safes until a pair is revealed. This is the winning multiplier for your original stake. The Gamma Girl icon is the wild symbol and substitutes to create even more winning combinations with the exception of the fire scatter, of course. You may not actually save the world by playing this slot game but there is the potential to accrue some quite substantial winnings. Gamma Girl will hit you with a K-A-P-O-W! and tick all your boxes. If you’re looking for some high octane slot playing action then certainly don’t look past Gamma Girl as your go-to destination for a bit of girl power. Wizard Slots rates this game 10/10. It looks great, too. As an alternative to slots, why not try Texas Hold Em?